Monty, a Great Pyrenees, was born on August 22, 2017. His owner's name is Marian. Riverview Pointe has always had a special meaning to Marian. Marian’s mom, Marylee, was a resident at Riverview Pointe in 2011 until her passing in 2016. When she adopted Monty, she wanted to share his playful spirit and kind nature with others. Riverview was one of the first places she thought of. She wanted to give back to the residents and staff by sharing Monty with our team. Monty began his training to become a certified therapy dog while growing up at Riverview since his puppy days. Adopting Monty happened by chance for Marian. He found her when she was asked to watch four puppies while the breeder was on vacation. “Monty was the only puppy with a collar on and was always the first one out of the pen, he would follow me around. He was supposed to be a show dog!”, says Marian. The residents look forward to seeing him a couple of times a month. They even celebrated his first birthday with us. 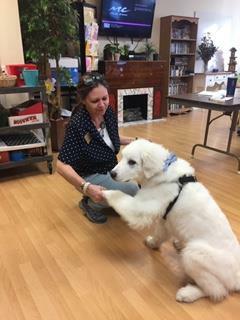 Monty passed as a therapy dog in February 2019 and now goes to other care centers as well. 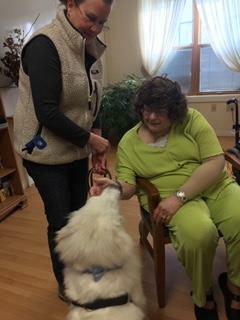 We love having Monty around and the residents and staff light up when they hear him coming down the hall. At Riverview, we believe it is important to embrace our Culture of Caring environment by allowing our residents the opportunity to spend time with Monty. He is loved by all at Riverview! Riverview Care Center and its parent company, Foundations Health Solutions, strive to be a "Culture of Care" - in every aspect of what we do. Whether physical health and rehabilitation or nurturing relationships and community, we aim to cultivate strong and healthy lives. Founded by Brian Colleran, Foundations Health Solutions is Ohio’s premier long-term care company. Formerly doing business as Provider Services, our team of experts has more than 15 years of experience successfully supporting over 100 multifaceted long-term care facilities. With strong Christian values and heritage, Foundations Health Solutions is committed to serving our communities with the highest level of clinical excellence and resident satisfaction, along with a strong employee culture which places priority and resources on the direct caregiving team.